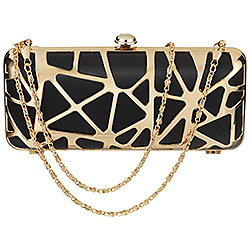 I stop short whenever I see a beautiful, unique clutch - and this also happens to be a makeup brush set , so it's a win - win! 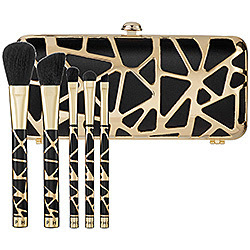 SEPHORA COLLECTION Deco Daze Clutch Brush Set has beautiful gold and black details on the clutch and well as the brush handles. It's a hard case clutch with a clasp closure and long gold chain -which makes it easy to carry where ever the holiday season takes you. The bag fits an average smart phone, keys, the brushes and of course a little more makeup like a lipstick or gloss. The brushes are very good quality and the clutch by itself is worth this price - so it's perfect not only for the beauty lover in your life but also for the bag/accessory addict too!